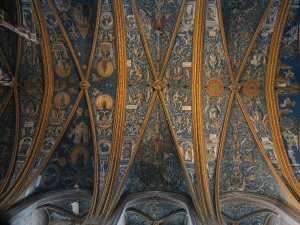 Day 15 : Tue 5 Jun : To Bergerac. Mmmm, lots of nice wine. After the success of the picnic and the meal at La Michodière the night before, the fact that there were hangovers was to be expected. However, the fact that Mark had got one big enough for all three of us was a bit of luck for David and Patrick. 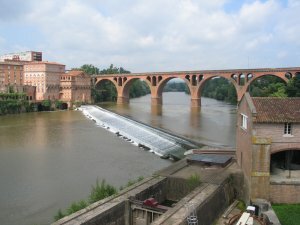 The morning was spent on the run to Albi, via Toulouse. Toulouse may have sausages and the Airbus factory: as far as we're concerned it has a adequate ring road to keep us moving. 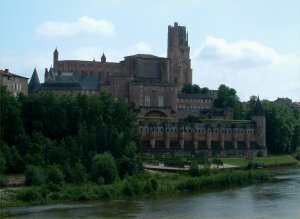 So we got to Albi, as planned, for a late lunch, checking in to an eccentrically-decorated hotel run by a very friendly, suitably helpful and slightly camp bloke who addressed us in O-level French so we could keep up. But the idea of a later lunch presented a small problem. Everywhere that looked as though it would sell us lunch stopped serving about ten minutes before we got there; but the grocers that would sell us the bits for a lunch kit wouldn't open for another half hour. Never mind, we'll take a look around the cathedral. No, there's a funeral being held there, we'll have to come back later. Much fruitless wandering failed to find any lunch, but did kill enough time for the shops to start opening again. A quick picnic in a handy park later, and we were ready to tackle the cathedral again. 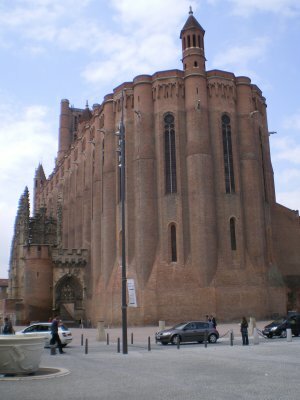 The cathedral appears to be a piece of Fascist architecture 750 years ahead of its time, and dominates the centre of Albi. This truly monstrous creation was erected as an unsubtle act of intimidation following the massacre of the Cathars, and centuries later its external design still carries a threatening air. 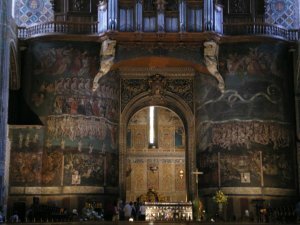 The interiors of the cathedral - absolutely classic examples of renaissance art in the Italian style, painted some hundreds of years later - appear to be less aggressive until you take in their subject matter. As well as the normal relish for the bloodier bits of the Bible (heads on plates and all that), the western end of the cathedral is dominated by a huge fresco depicting the hierarchy of the afterlife - in strictly-defined tiers we find the saints, the clergy and the holy, below whom we see a mass of sinners being gleefully tortured by various demons. Such effective maintenance of a theme of scaring the living crap out of people over the centuries is a genuinely awesome achievement on the part of the church authorities. 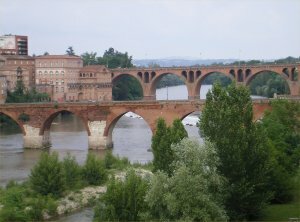 Other than a visit to the Henri de Toulouse-Lautrec museum, there wasn't much to do in Albi, so we wandered around the old town taking photos of the various bridges. Oh, and we found a restaurant hidden at the end of a dark alley, who did a huge Cassoulet, of which more later (in more ways than one).